Public issue of shares (also knows as IPO) is a very common way of raising funds by a corporate entity. However many a times it has been seen that after public issue of shares the listed price of securities falls below issue price which creates panic in the market and discourages the investors to put their hard earned money in IPO market. In order to encounter this problem, Green Shoe option is used in most of the IPOs which reduces the risk of fall in prices of the shares after listing of shares to a certain extent. Green Shoe option (GSO) is a price stabilization mechanism which is used in case of listing of Initial Public offer (IPO) or further public offer within first 30 days from the day of listing. The aim of this scheme is to provide price support in case prices falls below issue prices. Under this scheme upto 15% overallotment of securities is made after borrowing the same from promoters and if the prices falls after listing of shares then the shares are bought back from the market to create demand for the shares which provides price support. Example: Say X Ltd is going to issue 1,00,000 equity shares of Rs 10 each (Face Value) at a price of Rs 90 each (i.e premium of Rs 80). Out of the above say 20% will be issued to promoters and/or existing shareholders and balance 80% (i.e 80,000 shares) will be issued to public. In order to ensure that post listing price should not fall below Rs 90 (i.e issue price) stabilizing agent is appointed and he borrows (on returnable basis) 15% of total issue size (i.e 15% of 1,00,000 shares = 15,000 shares) from promoters / existing shareholders. The public offer is over subscribed and 95,000 shares (instead of original 80,000 shares) are issued to pubic and money is received in respect of 95,000 shares @ Rs 90. The excess application money in respect of 15,000 shares is kept in a separate bank account to be used in case prices falls below issue price of Rs 90. Say listing date is 1st March and hence golden shoe option will be available till 30th March (i.e maximum 30 days from date of listing). As we know the purpose of Green shoe option is to provide price support in case price falls below issue price (i.e Rs 90 in given case). Hence GSO will not be applied in case price is above Rs 90. On 5th and 10th day price is below Rs 90 and hence green shoe option will be exercised. Say on 5th day stabilizing agent purchases 2,000 shares @ Rs 88 and on 10th day stabilizing agent purchases 5,000 shares @ Rs 84. The above action will create demand for the shares and will provide price support to shares. Now after 30 days are over, stabilizing agent need to return 15,000 shares to promoters / existing shareholders. However he has only 7,000 shares (i.e 2,000 + 5,000). In the given case the shortfall of 8,000 shares will be met by further issued of shares by the company to the stabilizing agent @ Rs 90 and stabilizing agent will return all 15,000 shares to promoters / existing shareholders. From the above bank account we can see that surplus in bank account (arising out of purchase of shares at a price lower than issue price) is transferred to Investors Protection and education fund. The issued share capital of X Ltd will stand at 1,08,000 shares (instead of original 1,00,000 shares initially). Hence we can conclude that Green Shoe Option is a better mechanism to save the interest of shareholders in case of public offer to certain extent. (h) the specified securities borrowed shall be in dematerialised form and allocation of these securities shall be made pro-rata to all successful applicants. (2) For the purpose of stabilisation of post-listing price of the specified securities, the stabilising agent shall determine the relevant aspects including the timing of buying such securities, quantity to be bought and the price at which such securities are to be bought from the market. (3) The stabilisation process shall be available for a period <or = 30 days from the date on which trading permission is given by the recognised stock exchanges in respect of the specified securities allotted in the public issue. 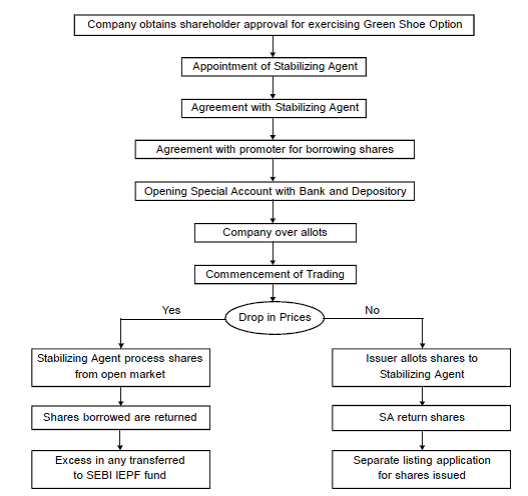 (4) The stabilising agent shall open a special bank account, distinct from the issue account for crediting the monies received from the applicants against the overallotment and a special demat account with a depository participant for crediting specified securities to be bought from the market during the stabilisation period out of the monies credited in the special bank account. (5) The specified securities bought from the market and credited in the special account with the depository participant shall be returned to the promoters or pre-issue shareholders immediately, in any case not later than 2 working days after the end of the stabilization period. (6) On expiry of the stabilisation period, if the stabilising agent has not been able to buy specified securities from the market to the extent of such securities overallotted, the issuer shall allot specified securities at issue price in dematerialised form to the extent of the shortfall to the special account with the depository participant, within five days of the closure of the stabilisation period and such specified securities shall be returned to the promoters or pre-issue shareholders by the stabilising agent in lieu of the specified securities borrowed from them and the account with the depository participant shall be closed thereafter. (7) The issuer shall make a listing application in respect of the further specified securities allotted under sub-regulation (6), to all the recognised stock exchanges where the specified securities allotted in the public issue are listed and the provisions of Chapter VII shall not be applicable to such allotment. (8) The stabilising agent shall remit the monies with respect to the specified securities allotted under sub-regulation (6) to the issuer from the special bank account. (9) Any monies left in the special bank account after remittance of monies to the issuer under sub regulation (8) and deduction of expenses incurred by the stabilising agent for the stabilisation process shall be transferred to the Investor Protection and Education Fund established by the Board and the special bank account shall be closed soon thereafter. (10) The stabilising agent shall submit a report to the stock exchange on a daily basis during the stabilisation period and a final report to the Board. (c) The details of allotment made by the issuer on expiry of the stabilization process.